You don’t need a lot of fancy ,expensive food gadgets. Just a few important basics. Keep your knives sharp and your tools handy. Implements need not be conventional to be efficient. Sharp knives allow even the thinnest slice to be uniform and tear free. A 400 grit piece of wet-dry sandpaper swiped in between uses keeps a knife razor sharp. It’s cheaper than a steel or wet stone and easier to use because you just hold it flat on the counter top or table. Conventional knife sharpeners, whether electric or manual take away metal from a knife blade every time they are used. Honing with wet-dry paper takes very little and therefore gives your knives longer, more useful lives. Round bottomed stainless steel bowls of consecutive size are multi-purpose. They conduct heat for quick chilling and heating of foods. They don’t have corners for ingredients to get stuck in while mixing, lending and hand in homogeneous texture, and there is is always one the right size for the job. Rubber spatulas are efficient scrapers so you don’t lose ingredients. 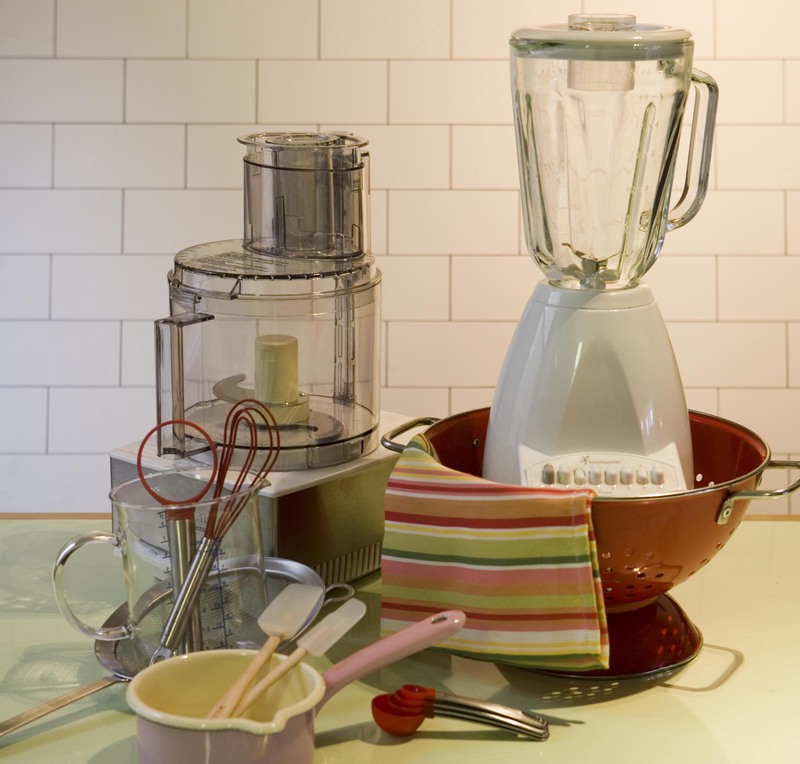 A blender is a great tool for liquidy things, while a food processor makes chopping, slicing, shredding and mashing a snap. The old stand-by’s of course; cutting boards and colanders, strainers of a few meshes….pots and pans, and sheet pans, pie pans and willing hands…dish towel, pastry brush, all a must. There’s not much else that’s really necessary. The disposables, of course, come in handy. Paper towels, zipper lock bags, wax paper, foil…plastic wrap, tooth picks….I’m sure you’ll think of more. While conceiving your repast, whether it’s a snack or a meal, build around one element. Fish, fowl, meat, vegetable, fruit, salad…..cheese, egg, dairy….Add from there to enhance your creation. When you think of flavor elements, such as onions or peppers, tomatoes, or squash, remember that they come in in many shapes and sizes. The way you cut them can change the look of your dish entirely. Rounds, diagonals, wedges….slices, dices, julienne….shredded or mashed. Peel or leave the skin on. The size of the cut can make a big difference. The many varied root vegetables are great raw and cooked. Carrot, parsnip, turnip, potatoes, yams and celery. Celery? Well it’s not a root vegetable but acts like one sometimes. Greens and herbs offer a variety of shades, colors and textures from the subdued hue of the tiny leafed thyme to the bold color and shape of basil. Dill is fluffy and bright. Romaine and endive are crunchy and light. Seeds, nuts and dried fruits…pickles olives and condiments….All can dress up a simple plate. Citruses: lemon, lime, orange grapefruit aand kumquat…Zest, slice wedge or section. Berries: raspberries, strawberries, black and blueberries….sliced fruit of any sort……all can garnish and palette refresher. Making food look beautiful is an attitude, not a skill. Think of your ingredients as art supplies. Color, texture, composition and drama, are just as important as flavor. A bagel with lox and cream cheese or a tuna fish sandwich can become works of art.